Once we receive your order and payment in full, you will be sent a confirmation email. Please check your “Junk” box and add info@bumblesvintage.com.au to your contacts to ensure you don’t miss any email order updates. All Australian deliveries are tracked using Australia Post parcel post tracking service. All orders within Australia are delivered FREE via parcel post. Items are usually dispatched by the next business day and take 2 to 5 business days for delivery. If you select express post, you should receive your order within the next business day after dispatch provided you are within the Express Post Network. Australia Parcels for orders over $100 are sent via registered post, which requires the recipient’s signature. Please ensure that the recipient will be available to sign for the package or to collect it from the post office with proof of identity. All international parcels are sent by international registered post. You may opt for postal insurance at checkout. If you choose not to purchase postal insurance, the package will be shipped at your risk. We are not responsible for any loss or damage once the package leaves our warehouse and you indemnify us in this regard. For this reason, we highly recommend that you purchase postal insurance at checkout covering the full purchase price of your order. Shipping to the United States costs $12.65 for international Airmail with Signature on Delivery. To arrange international shipping elsewhere, please contact us for a postage quote. The buyer is responsible for all import duties and taxes payable. Payments are processed using your PayPal account, Mastercard or Visa credit cards. We also accept bank transfers and cheques. Please contact us at info@bumblesvintage.com.au if you would like more details about paying via direct deposit or cheque. Since credit card and PayPal payments are transmitted via a third party provider (PayPal), Bumbles Vintage will never see or have access to your credit card details. PayPal is a leading payment processor who offers fast and secure online payment options. Your financial details will be securely kept by PayPal. We never disclose buyer’s details to any third party unless required by law. Please note that vintage and antique items are not brand new, which means some signs of wear should be expected. 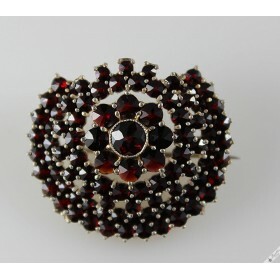 We seek to provide all our jewellery in excellent vintage condition. 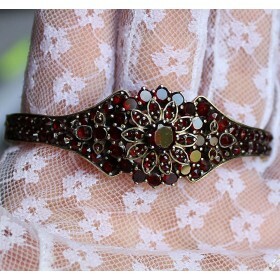 We do not sell items which are broken or which have pieces missing. If an item is particularly rare or unique, we may still offer it for sale if it is scratched or has other minor flaws, however any defects will always be noted in the description. To ensure customer satisfaction, we offer a 3 day full money back guarantee. Please see below for details on returns. Many collectors refuse to polish their pieces as they value the natural patina and tarnishing that forms over time. All items displayed on the website are sold in the exact same condition as they are sourced. We never polish or refurbish pieces. Any silver or gold can be polished, however polishing is completely up to you. We do not offer a cleaning service in house; this can be done by your local jeweler. Even though many of the items we sell are stamped and some hallmarked, we test every piece to ensure its fineness. 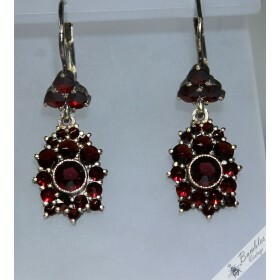 If a piece does not pass the scratch/acid test, it will be noted as “fashion” jewellery. For items that do pass our tests, if there is no hallmark, the piece either never had one to begin with or it has been worn down over time. Please take note of the measurements listed on the website. Items may appear larger in images than they are in real life. Photographs are taken up close to give buyers a good view of each piece. We try to measure each item as accurately as possible. Please use the measurements provided as approximates only to give you a guide. We aim to provide accurate dates for each piece using our knowledge and research. 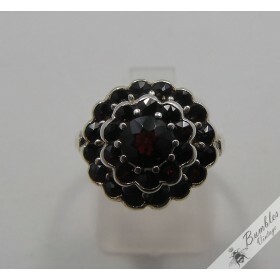 Jewellery that is not marked is very difficult to date and descriptions of same are therefore to be taken as estimates. Items which are hallmarked can be dated more accurately. If any item does not meet your expectations, we offer a full money back guarantee within 3 days. Once you receive your item and you are not entirely satisfied with your purchase, you may return it to us within three (3) days for a refund. Return the item in its original packaging ensuring it's packaged or re-packaged securely. Return of the item is at your risk and any damage or loss is your responsibility. We recommend you take out postal insurance and require signature on delivery to protect you against loss or damage. Your refund will be issued once the item has been received by us in the same condition as dispatched. If the item is damaged in transit, make sure to present the item to the delivery provider in the first instance for verification. In this instance, I will refund the cost of shipping, including return shipping. If the item is lost in transit, please contact me to start an investigation with Australia Post. Please note that I will not issue a refund if the tracking shows that the item has been delivered. You may cancel your order for a refund or credit (your choice) if your item has not been dispatched. You will be refunded/credited within two (2) business days of your cancellation. If your item has already been dispatched, you will need to follow the return process above once you receive your order. Your Statuary Right are not affected. Use of the Website constitutes acceptance of these Terms of Service. We reserve the right to amend these Terms of Service without any notice to you. If we do this, the new version of these Terms of Service will be posted on this page. The bottom of this page indicates the date these Terms of Service were last updated. If you continue to use the Service after any amendments are posted, this constitutes your acceptance of the new Terms of Service. IF YOU DO NOT AGREE TO THESE TERMS OF SERVICE, YOU MAY NOT USE OR ACCESS THE SERVICE, AND SHOULD NOT PROCEED TO ORDER FROM US. BY USING THE SERVICE YOU ARE AGREEING TO BE BOUND BY THESE TERMS OF SERVICE, INCLUDING ALL AMENDMENTS MADE TO DATE. We strongly advise against disclosing your password to any person. You are responsible for all actions undertaken with your Username and Password. If your password is tampered with in any way, you should immediately change your password or request a new password using the Lost Password Recovery Form. If you suspect any unauthorized use of your account, you must report it to us immediately. We recommend that you change your password on a regular basis. You must not respond to any request for your password by anyone, even if the request is made by someone claiming to be an employee of us. We will never email you asking for your password. You must immediately notify us if you receive such a request. We own and reserve all rights to copyright in this Website including all content, text, graphics, design, photos, videos, logos, button icons, visual interfaces, interactive features, images and audio clips (“Our Content”), excluding your Content. Further, we and/or our software suppliers own all software used on the Website. All such software and material posted by us and/or our Members is protected by domestic and international copyright laws. You may only use this material for browsing the Website in accordance with the Terms of Service and you are strictly prohibited from reproducing, adapting, modifying, distributing, transmitting, republishing, displaying, framing, downloading, transmitting, performing, renting, leasing, loaning, selling, assigning, licensing, sublicensing, reverse engineering, publicly displaying or creating derivate works of the Website, the Service, our Content or Member’s Content in whole or in part without our prior written authorization or the prior authorization of the owner of such content. We do not grant any express or implied rights and we retain all rights in and to the Website, the Service and Our Content. Due to occasional upgrades and maintenance, we cannot guarantee 100% continuous, uninterrupted access to the Website. Although the Service is normally available, there may be occasions when the Website will be interrupted for scheduled maintenance or upgrades, for emergency repairs, or due to failure of telecommunications links and equipment that are beyond our control. 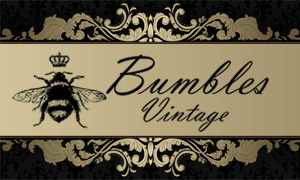 “Bumbles Vintage” is a Trademark of Bednar International Pty Ltd. Users may not use this trademark unless expressly authorised by us. We may provide links to other websites and services which are independent of us. We are not responsible for the content, accuracy or opinions expressed in such services, and such services are not investigated, monitored or checked for accuracy or completeness by us. Approval or recommendation of a website or service by members of the Bumbles Vintage community are independently submitted by members and do not reflect the opinion of Bumbles Vintage. Inclusion of any linked or referenced website or service on or through the Website does not imply approval or endorsement of the linked/referenced service or website by us. If you decide to access these third-party sites or services, you do so at your own risk. You acknowledge that you cannot bring legal action against us or any Related Party for any damages of any kind, under any theory, as a consequence of using the Service. Any and all images or content uploaded or written to the Website may be used by us without any restriction(s) as marketing materials. By accepting these Terms of Service you specifically authorize us to use any images you upload to the Website for marketing this site in our sole discretion. The material found on this website is for general informational purposes only. This service is not intended for providing any valuation or expert advice. We do not and cannot make any representation or warranty as to the accuracy, completeness or currency of any information or content provided on or accessible via the Website. We will not accept any and hereby exclude all liability for such information or content. We provide the Service as-is, with all faults and as available. We do not guarantee the functionality of the Website or any particular result from the use of the Service. We expressly disclaim any responsibility for any loss or damage, including personal injury or death, resulting from the use of the website or from any content posted on the Website. We exclude and disclaim all warranties, guarantees and conditions whether express or implied to the fullest extent permitted by law including without limitation any implied warranties as to fitness for a particular purpose, merchantability, workmanlike effort and non-infringement. We exclude all warranties to the fullest extent permitted by law that using the website will not result in infringement of third party rights, including but not limited to intellectual property rights. You agree that we are not liable for any loss of profits or any other loss, damage, personal injury, expense or claim arising out of or in connection with your use of the Website. We exclude all liability relating to any errors, omissions or defamatory content contained or implied in the Website. To the extent permitted by law, in no event will we or any Related Party be liable to you or to any third party for any loss of profit, loss of use, business interruption, medical illness, personal injury, death, loss of data or cost of procurement of substitute goods, technologies or services, cost of cover or punitive, exemplary, indirect, special, incidental or consequential damages arising from or related to the use of the Service or these Terms of Service even if we and/or any Related Party have been advised of the possibility of such damages. Notwithstanding anything in these Terms of Service, our and the Related Parties’ aggregate liability to you in connection with the service (including any third party or Member Content on the service) and these Terms of Service will be limited to the amount, if any, paid by you to us for the Service. You agree to indemnify and forever hold us and the Related Parties harmless against liability for any loss, claims, demands, proceedings, damages, expenses and costs, including legal costs on an indemnity basis, made by you or by any third party as a result of or in connection with your use of the Service, your Content, your use of content on the Website, your conduct in connection with the Service or with other users of the Service or your breach of these Terms of Service or any applicable law or the rights of any third party. We do not make any warranties or representations whatsoever that the Website complies with the laws of any country outside of Australia. Access from overseas countries is done so at the users’ own risk and any liability is excluded by us in this regard. If any provision of these Terms of Service or any policy or document found on this Website is void, voidable, unenforceable or illegal in accordance with its terms, but would not be void, voidable, unenforceable or illegal if it were read down and it is capable of being read down such provision shall be read down accordingly. in any other case, the whole provision is hereby severed, and the remainder of these Terms of Service and any policy or document on this Website shall be of full force and effect. We may assign our rights to these Terms of Service in our absolute discretion without giving any notice. You are strictly prohibited from assigning or transferring any rights you may have under these Terms of Service. Any attempted assignment or transfer by you shall be void and without legal effect. The failure, delay or omission by us to exercise any power or right conferred upon us by these Terms of Service shall not operate as a waiver of such power or right, nor shall any single exercise of any such power or right preclude any other or future exercise of the power, or the exercise of any other power or right under these Terms of Service. A waiver of any provision of these Terms of Service, or consent to any departure by a participant from any provision of these Terms of Service, must be in writing and signed by us (non-electronically) and is effective only to the extent for which it is given. You agree that any notices under these Terms of Service and any notices that the law requires us to send you may be given by us electronically by email or by posting notices on the Website. You agree that all communications from us including all notices, agreements and disclosures may be provided by us in such electronic form which satisfies any legal requirement that such communications be in writing. As long as you access and use the Service, you will have the necessary software and hardware to receive these notices. If you do not consent to receive any notices electronically, you must stop using the Service. Notices provided to you via e-mail will be deemed given and received on the transmission date of the e-mail. You may notify us by email (info@bumblesvintage.com.au). These Terms of Service together with all policies and documents incorporated by reference comprise the entire agreement between you and us. You agree that you have not relied on any prior representations, statements, claims or agreements not contained in these Terms of Service. No agency, partnership, joint venture, employee-employer, affiliate or franchisor-franchisee relationship is entered into or created by these Terms of Service between you and us. You agree that we do not owe you any fiduciary duties. By using the Service, you agree to resolve any disputes with us by first contacting us via email. If you are not able to obtain resolution of your dispute via email, you agree that it will then be resolved by confidential mediation located in Queensland, Australia. You and we agree to be bound by the outcome of such mediation. You agree that each party will bear their own costs of the mediation. To lodge a dispute, please email the details of your dispute to info@bumblesvintage.com.au. This provision will not apply where you have in any manner violated or threatened to violate our intellectual property rights in which event we may seek injunctive or other appropriate relief in any state or federal court in the state of Queensland Australia and you irrevocably consent to the exclusive jurisdiction and venue in such courts. You agree that the laws of the State of Queensland Australia, without regard to principles of conflict of laws, will govern these Terms of Service and any dispute that might arise between you and us and/or Related Parties in connection with the Service. You agree not to commence or prosecute any action in connection with the Service other than in the state and federal courts of Queensland, Australia and you hereby consent to, and waive all defenses of lack of personal jurisdiction and forum non conveniens with respect to, venue and jurisdiction in the state and federal courts in or closest to the Gold Coast, Queensland, Australia. ‘Personal Information’ means any personal information including but not limited to name, address, email address, contact details and usage information. ‘Service’ means your use of the Website and the services and information available on the Website and/or purchase of any items listed on the website..
‘Website’ means the website under the domain name bumblesvintage.com. ‘You’ and ‘Users’ includes Members and any persons accessing the Website. ‘Member’ means any person who creates an account on the Website and any director, proprietor, trustee and any other person responsible for the Member where the Member is a company, business or trust or any other entity. 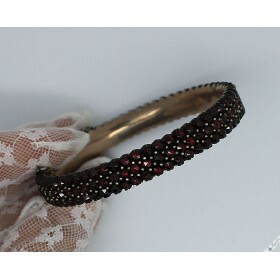 Dark natural Bohemian rose cut garnets The brooch does not bare any hallmarks 900 silver puri..
~ Circa 1900s, Victorian Era ~ A gorgeous antique bracelet from former ..
~ Victorian Era ~ Natural rose cut Bohemian garnets. 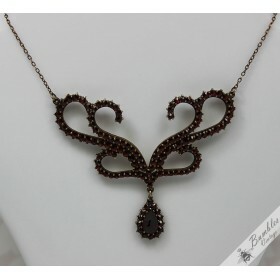 Set in base m..
~ c1960s ~ A stunning vintage Bohemian garnet necklace in Art Nouveau d..
~ Circa 1960s ~ Natural, rose cut Bohemian garnets (the centre stone is..
Natural Bohemian garnets 900/1000 silver Czechoslovakian hallmark Additionally stamped "G2"..